A lot of people dream of having a freezer stocked with heathy home cooked meals, but they think cooking ahead is too time consuming and too complicated. This week I'm going to show you that is absolutely not true! First, I will discuss the components of a cook-ahead plan and show you exactly how to create each part, then I will show you three different kinds of cook-ahead plans that will help you fill your freezer simply, quickly and easily - regardless of how much time you have to spend. Today I want to concentrate on the first step - checking your inventory and buying the groceries - and in order to show you exactly how to do this, I will use an example. 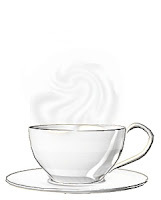 When planning a cook ahead session, you don't want to plan on more than an hour or two in the kitchen to start. You can do quite a lot during this time, but keeping it short allows you plenty of time to finish all your cooking, cleaning and freezing during one session without exhausting yourself. If you make enough of each recipe to feed your family twice, you will end up with six family meals for your freezer at the end of this cooking session. Because you are only using each appliance once, you will be spending a lot less time while still getting the same result. 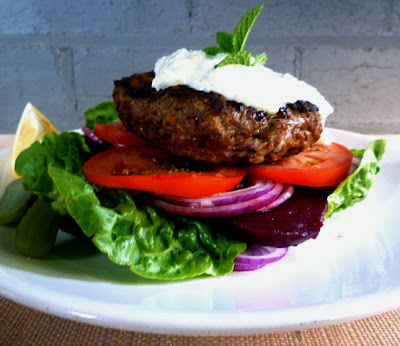 ....and some hamburgers to barbecue later in the week. 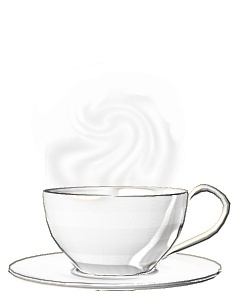 The first thing I am going to do is check my recipes to see what ingredients I will need. This is where I find buying the forms I wrote about yesterday invaluable. 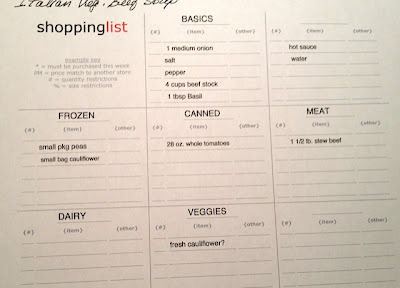 I make up one shopping list for each dish that I want to make, print it out, then keep it in a section of my Household Manual. (Don't worry ... I'm going to show you exactly how to do that in a minute! ) 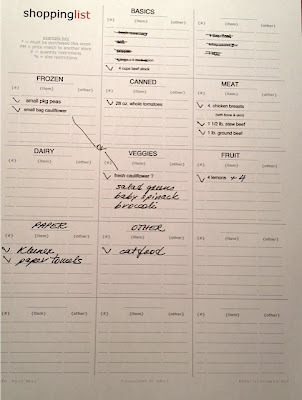 When I want to make that dish in the future, all I have to do is find the shopping list and transfer the items to my master shopping list for that week. 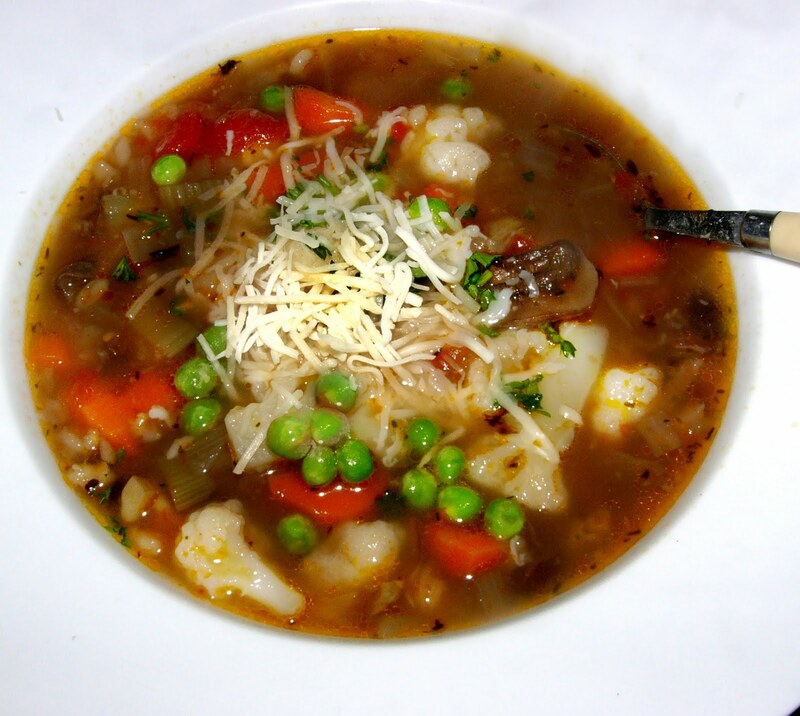 Here is how to make a recipe shopping list using the Italian Beef soup as an example. The first thing I do is divide the ingredients into categories using the Shopping list form. There are basics that I probably already have so I list these first. Then I make categories for my other ingredients. In this case we have frozen vegetables, canned goods, and meat. I list all the ingredients under the appropriate headings. A good way to check to make sure you haven't forgotten anything is to count the number of ingredients in the recipe and check it against the number of items on your shopping list. In this case I have 11 ingredients (salt and pepper are 2) Once you get good at this you can leave out things like water that you know you have, but to start with list everything just to be safe. As you can see above, I now have a shopping list for this specific dish. The categories above are the ones I use the most, but these can be changed. Choose the ones that make the most sense for your recipes. This might seem like a lot of detailed work, but it really isn't. 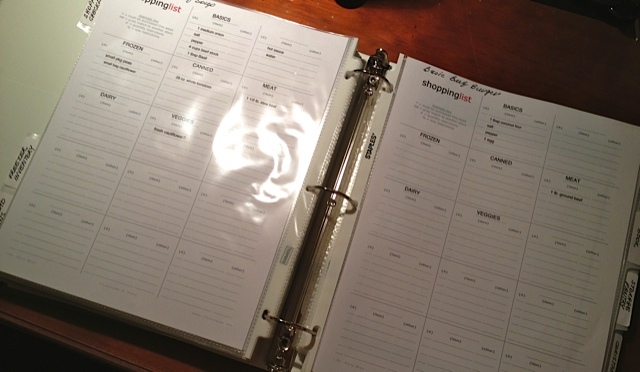 Creating a separate shopping list for each dish will not only make it easier not to forget an ingredient you need, it will also allow you to easily make up different cook ahead plans in the future. 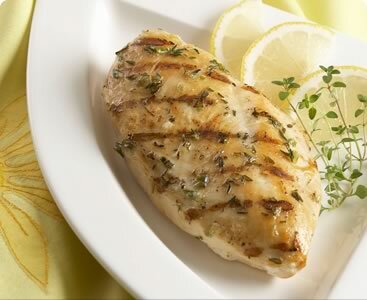 Most people only have a dozen or so favourite recipes that they use most of the time. 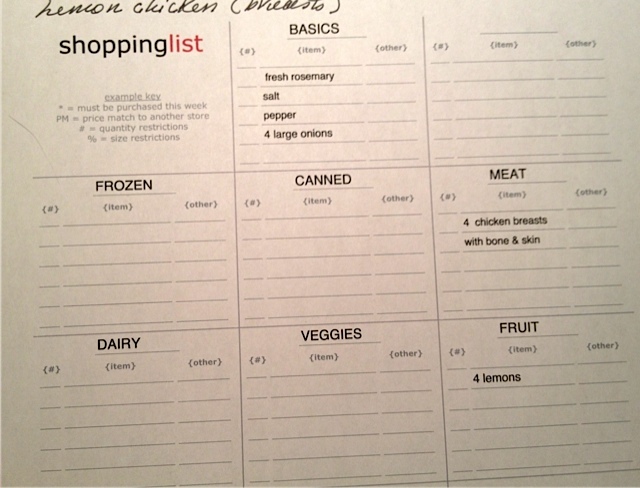 Once you have made shopping lists for your recipes, creating a new cook-ahead plan is easy. 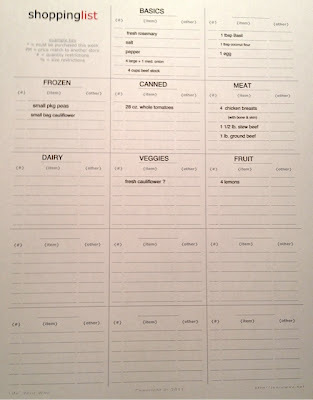 Just take the lists for each dish you want to cook that particular day, and transfer the items to your main shopping list as I show below. 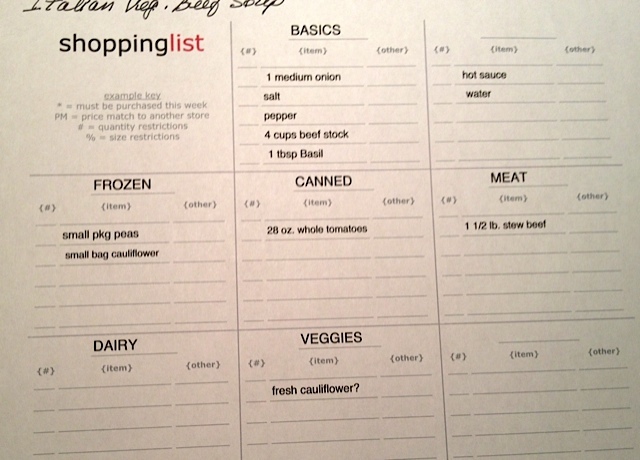 And here is my master shopping list with all the items I will need to make all three dishes. 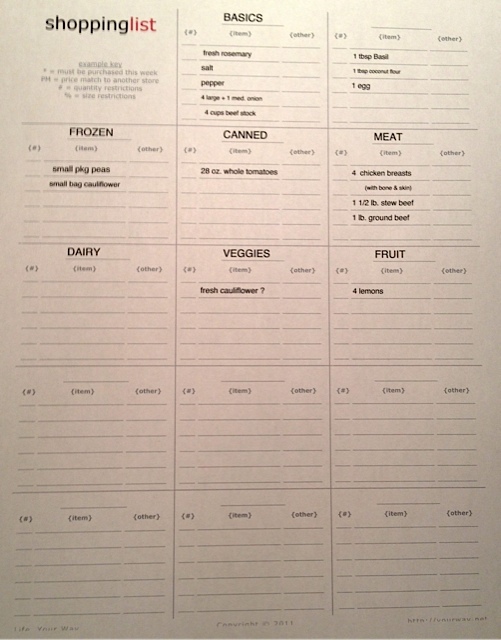 Because I have bought these forms, I can now save this cook ahead plan shopping list in a file on my laptop, and the next time I want to do this same cook ahead plan again, my shopping list will be ready for me to print. 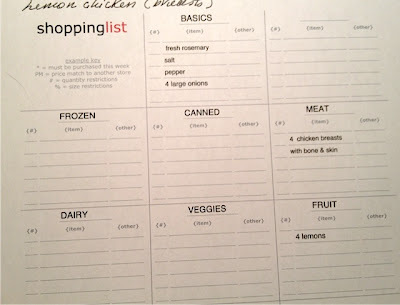 So now that I've printed my completed shopping list, all I have to do is check my cupboards, pantry and freezer to see which supplies I have and what I still need to buy. If I need an item, I will tick it on the list. 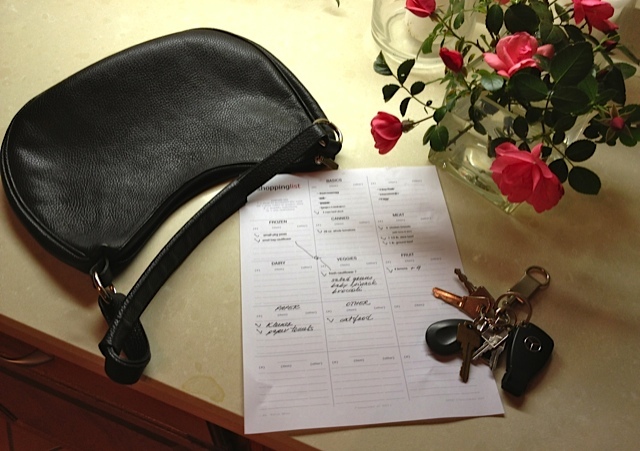 Once I know what I need, I cross off the other items, add the other things that I will need to buy that week, and I'm ready to shop. There is one optional step. 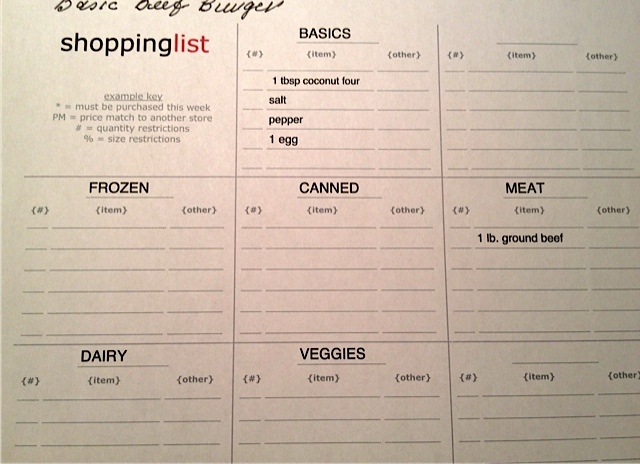 If you use a shopping list app on your phone as I do, you can now transfer your list. Even though I love this convenience, I also love having a physical copy I can stash in my car just in case my online version is not available for some reason. Now all I have to do is shop for the items and put them away, then I am ready for step two - doing the prep work - which I will cover tomorrow. Print out 4 copies of the shopping list here. Make shopping lists for all 3 recipes. 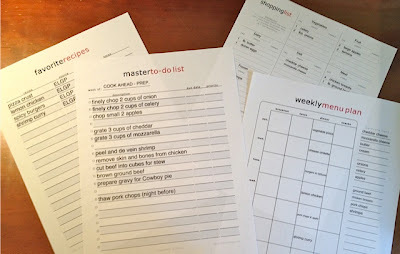 Make a Master Shopping List for your cook ahead plan. Now you're a third of the way there! See you tomorrow for step two. I love this!!! Thank you so much! 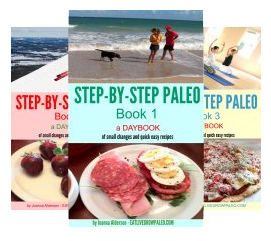 We just started Paleo while I have been off of work for 3 weeks.. this is going to help with the transition! This link for the forms dose not exist anymore-I would love to figure out how to use the forms.